Creating a detailed marketing plan provides firms with an integrated strategy that outlines the necessary tools, steps, and tactics to achieve far more than the sum of individual efforts. 32% of firms do not have active and consistent marketing efforts. 20% blame lack of planning as their reason for inconsistency. 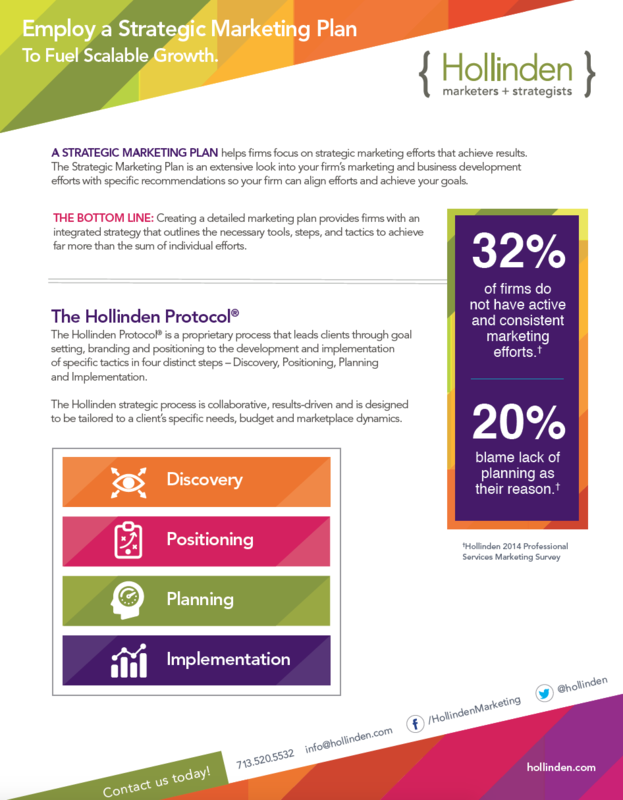 The Hollinden Protocol® is a proprietary process that leads clients through goal setting, branding, and positioning to the development and implementation of specific tactics in four distinct steps – Discovery, Positioning, Planning, and Implementation. The Hollinden strategic process is collaborative, results-driven and is designed to be tailored to a client’s specific needs, budget and marketplace dynamics.